On a cold but sunny December day fourteen walkers set off from the Community Centre-we picked up another two on route-to walk to the Duchy Nursery. All were wrapped up from the winter chill to work off those stiff legs and any over indulgence and enjoy the brilliant countryside we have around us and in great company. We turned right off Cott Road to make our way along a public footpath past Millham Farm to Polscoe and then made the long steady climb to join the road to Respryn. Although spreadout on the climb we soon all got together again to walk the quarter of a mile before we turned left again to head down to the Nursery where on a majority or it may have been unanimous vote we stopped for a drink and in most cases some light refreshment; sitting outside with a view of the castle and the sun still shining. After being well watered and fed we set off again on the road-it was reported that the wood and river crossing were very wet and muddy- to return to town and the end of a pleasant walk. AS WE ARE AWAY UNTIL 12TH COULD YOU PLEASE LET US KNOW WHETHER YOU ARE COMING AND IF YOU ARE ABLE TO OFFER A LIFT BY WEDNESDAY 7TH JANUARY . We will meet as usual at 10.15am at the Community Centre for a 10.30am departure to Wadebridge. We will meet as normal at 10.15am at Community Centre for 10.30am start. Please let us know by MONDAY 29TH DECEMBER if you are going on the walk. A Happy Christmas to all the group and thank you for your company during 2014-we hope to see you for our first long walk in 2105 on Tuesday 13th. Further details nearer the date. Deadman or Deadman's Point and at 400ft high is the highest headland on the south Cornwall coast. After passing the earthwork we turned left to head towards the large cross-an ideal photo opportunity although standing still to take the photo was difficult in the high wind. This sepulchral granite cross placed there in 1896 by the Reverend George Martin, rector of nearby St Michael Caerhays. Just inland from the cross, but hidden by scrub, is the Dodman Watch House, a survivor of the late 18th century and much restored when used as an Admiralty signal station and subsequently by coastguards and restored by the National Trust. for swimming-nobody had a towel! we proceeded around the headland with a slight drizzle at time blowing off the sea to see the harbour of Gorran Haven. Post Office to treat ourselves to a cuppa and assorted cakes. camp grounds of Trevague Farm and across another field before we reached the car park. 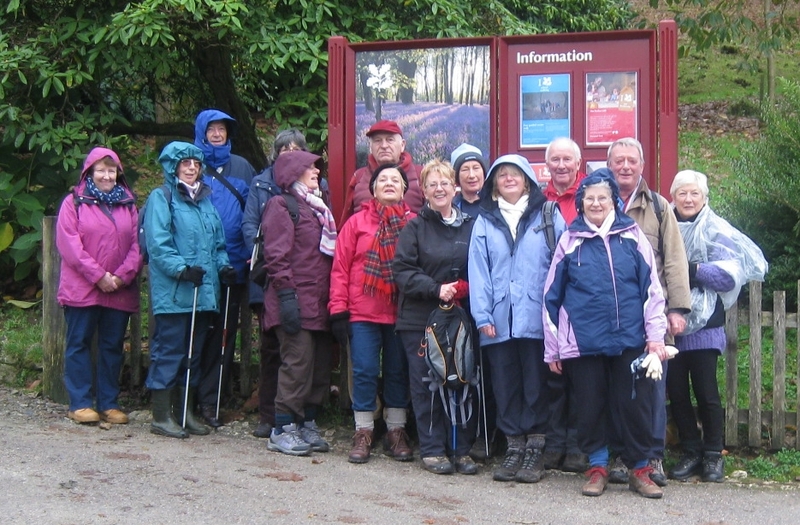 The rain did start to increase slightly but did not start in earnest until we had reached home-a good walk with great views even with the cloudy weather and as usual a great friendly atmosphere. 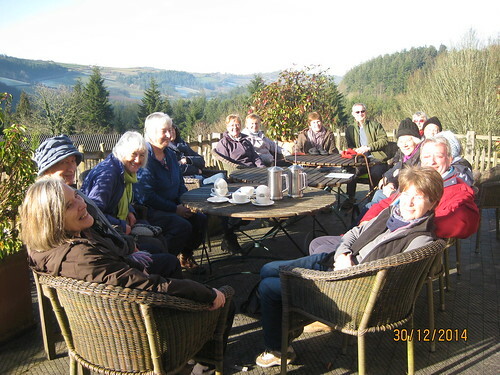 Some 15 walkers arrived by car or even walked (well done both) to Respryn Car Park on a frosty morning to start our short 3 mile walk through the South Park to the house and then back on ourselves through the Great Wood to the River Fowey and back to the car park. well with the occasional stop to look at the views and admire the colours of the trees that are quickly loosing all their leaves. With our normal photo shoot at the top near the grand house and main gate we headed back down again on well marked footpaths covered in leaves to the track we had left earlier and were met by about 20 ewes and lambs, well controlled by a sheep dog, that were heading into a field . Following footpath signs we then proceeded to the river then along the river bank for a short distance before crossing and walking between the river and the railway line. Although the rain had started it was only light and with the tree canopy it did not seem to cause too much inconvenience only making the underfoot a bit more slippery with all the leaves. The River Fowey at this point has been voted one of the top 5 places in Cornwall for wild swimming but unfortunately we had all forgotten to pack our trunks!-maybe next time. After a short walk we reached the famous Respryn Bridge- a five arched mediaeval bridge spanning the River Fowey. The place name indicates that there had been a ford here before the bridge was built; carrying an ancient trackway between Bodmin and Looe. By 1300 a bridge had been built here of granite and rubble construction. Of today's bridge the central pointed arch dates to the fifteen century and probably represents part of the original construction which replaced the earlier thirteen century bridge. The other arches are round and the two on the west side relatively modern. the other royalist. King Charles rode over the bridge in 1644 on his way from Boconnoc to Lanhydrock-thus historically linking our last two short walks. Following his route we crossed the bridge back to the car park after a few hours exercise and good company. 1) 3 mile gentle stroll with very mild gradients. 3) Walking on forest track and footpaths. We will meet as normal at 10.15am at Community Centre for 10.30am start. Please let us know by Saturday 22nd November if you wish to go on walk and if you are able to offer transport. Due to the severe weather warning issued today for our region we decided not to lead the 8 other members of the walking group, who had requested to go, onto Dodman Point ;in hindsight at 2.00pm a good decision. We hope weather permitting to try again on the 9th December. 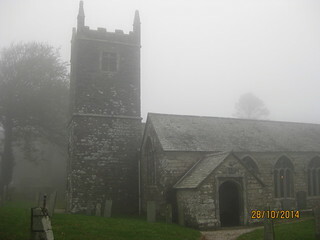 On a hazy autumn day,typical except for the warm temperature of 16 degrees C, we were greeted at the church at Bradoc by the lovely smile of Sue ready with mugs of tea or coffee and assorted biscuits including custard creams and bourbons. We all had smiles on our faces when we also noticed that Sue S had produced a red and white cake box which was full of home made currant buns-my favourite a real treat-many thanks to both Sues for this great start. After 20 minutes of eating, drinking and chat we decided that we had better walk,the real purpose of the group, the mile and a half through the Boconnoc Estate to the House. The walk through the estate and the tour of part of the house had been arranged by Rob and permission granted by Mr and Mrs Fortescue -we thank them all. We were greeted in the grand entrance hall by Jill McCombie who was our guide and historian for the morning and treated us to more tea and coffee and biscuits before we adjourned to the drawing room to listen to a brief history of the house and estate from prehistory through 1086 to the present day. An excellent introduction was given of which only some headlines will be given here but further information can be obtained from local libraries and from the web site www.boconnoc.com. The estate and house have seen many ups and downs and changes during its life and control passed from different famillies since Sir William Mohun bought the property in 1579 and it remained in that family until 1717 when it was sold to Thomas Pitt for £54,000-the money being raised by the sale for £135,000 of the Pitt Diamond which was subsequently set in the hilt of Napoleon's sword which can be seen at the Louvre in Paris. to George Matthew Fortescue, son of Lord Grenville's sister Hester, who married the first Earl Fortescue of Castle Hill , Devon. It has remained in the Fortescue family ever since. Under the present owners Anthony and Elizabeth Fortescue much careful restoration has been undertaken using artisan craftsmen to produce what it is today a thriving business catering for weddings, venue hire, accomodation and special events. We also learnt from Jill that A L Rouse had been a visitor to the house and she read one of his poems written about the estate. All those walkers who went on the Blackhead walk or who have read my report on the U3A web site "Blackhead-a lovely spot!" will be familiar with A L Rouse (Alfred Leslie) and his works. After all that knowledge imparted by Jill we said our thanks and took a similar route back, although some went to have a look at the church and stable yard,and were again greeted by that smile and a tea pot and for those lucky ones some currant buns that had not been eaten at 10.00am to go with our packed lunches. 1) 5 mile walk of moderate difficulty taking in the ups and downs of part of the South West Coast Path. 2) Parking at the National Trust car park at Penare. 3) Cafe and toilet facilities at Gorran Haven. 4) Wonderful views, on a clear day, across Veryan Bay from this dark and brooding promontary. 5) Walk takes in coast path and inland paths which can be muddy. 6) Bring packed lunch and/or use cafe at Gorran Haven for our lunch stop. Saturday 8th November if you wish to go on walk and if you are able to offer transport. old boundary can still be seen in Kingsand. The walk covers the most easterly extension of the Rame Peninsular, known by local people as 'Forgotten Corner'. This was a new venture for the walking group, not only traveling a bit further than normal from our base but also increasing the length of walk to 8 miles albeit with a shortened 4 miles version for those who wanted. jointly by Cornwall County Council and Plymouth City Council. It is used today for numerous activities such as a conference centre and wedding venue and open to the public. woods and a bit more of a scramble around a large fallen tree we all manged to get to Hooe Lake Valley with stunning views across the estuary and the breakwater. With the sun now out and walkers gradually shedding clothes as we heated up. Much activity in the bay with military vessels and freight carriers. After an other mile along the estuary with Kingsand and Cawsand in sight we were soon sitting on the sea front in front of a cafe and tucking into our well earned lunch. proceeding up and above Cawsand Bay with even better views of Plymouth Sound. Empacombe surrounded by some stunning holiday accommodation and at the entrance to Millbrok Lake. A short 1/2 mile walk takes us back past an Obelisk and to the car park. A good time was had by all and the new venture was worth the extra effort so we will include a few more 8 milers into our schedule. No plans yet for the overnight stop but the 40 mile Saints Way was mentioned. Watch this space.! 1) We will meet at 9.45am at the Community Centre for a 10.00am start. Please note that this is Flu Injection day so Community Centre car park will be busy. 2) This circular walk starts from Cremyll car park (a payment car park) and takes in Kingsand and Cawsand before returning on the north shore line. Total distance is 8 miles with 7 stiles but bus can be caught from Kingsand to return to Cremyll thus reducing walk to 4 miles. 3) Walk is relatively easy and on good paths or tracks. 5) In view of the distance to the walk I would like to reduce number of cars travelling to Cremyll so could you please let me know whether you will be coming, what distance you hope to cover and if you are willing/able to offer transport by Friday 10th October. Following last April's successful trip around the estate and tour of the church we are repeating the walk but this time we are being given a tour of the house. Again this has been organised by Rob and Sue and permission for the walk has been granted by Mr and Mrs Fortescue who will be leading our tour of the house; we are very grateful for all their help and permissions in organising this trip. 1) We will meet at 9.40am at the Community Centre so that we can be at Bradoc Church by 10.00am. 3) The total circular walk is about 4 miles and facilities are provided on the estate near the church. 4) We will be shown around the house and be provided with tea/coffee/biscuits by Mr and Mrs Fortescue - a charge of £5 per person will be made to go towards upkeep of the estate. This will be collected on the day. 5) We will then return to Bradoc to eat our packed lunch bought with us and again Rob and Sue will provide tea/coffee before we return home. 6) It is important that I know numbers by Saturday 18th October so would be grateful if you could let us know by that date if you are coming and if you are willing to offer transport to Bradoc. Our party of 11 walkers, including three potential new U3A members, set off from Coombe Farm National Trust car park to walk the coast path into Fowey. Within a few minutes with the sight of the calm sea ahead we were heading for Readymoney Cove and the short walk to start the trail at Barclays Bank. We divided into two groups and with the competitive spirit fired up both groups searched the town to find answers to the eighteen clues. As the trail leaflet was slightly out of date and some buildings had changed their uses and others were being refurbished we all found it difficult to eliminate all the suspects and find the murderer but it was a fun way to see some of the back streets of Fowey and learn more of the history of this local town. Some of us ended up in a local cafe before we managed to climb back up the slope to the car park and back home by 2.15pm. This follows similar walks we have completed in Lostwithiel and Bodmin and is more about learning about the town and using our brains rather than our legs. 1) We will start at Coombe Farm National Trust car park and walk into Fowey via Readmoney Bay. 3) Facilities and places to eat/drink available for those who want them or bring your own. We will meet at the Community Centre as usual at 10.15am for 10.30am start. Please let us know by Saturday 27th September if you are coming and able to offer transport. Next walk after this will be long walk on 14th October; details to follow. On another glorious September morning thirteen walkers set off from Ponts Mill car park to walk the 5.75 mile circular route through Luxulyan Valley and back using part of the Saints' Way to St Blazey and up the canal towpath to the car park. With the hot sun the first part through the wooded valley with a swiftly flowing stream alongside was a joy. We passed the remains of the Trevanney China Clay kilns and its towering chimney used from 1920 to 1965. This valley was a centre of industrial activity in Victorian Cornwall with copper being produced and hauled to Ponts Mill and then down the Par canal to Par harbour. A second tramway linked Luxulyan to Ponts Mill and allowed Joseph Treffry to develop granite quarries in the upper valley. Our first photograph is taken at the base of the Treffry Viaduct built between 1839 and 1842 from local granite; the viaduct conveyed leat water to the copper mine and stands at 30m above the valley floor. With the ten majestic arches it was the first of its type to be constructed in the south west. After the climb to the top-without ropes or safety harnesses -we took our second photo-guess who is missing?? After a slight detour to see a" black water pipe" we went the correct way to join up with the Saints' Way- a 30 mile trail from Padstow to Fowey, known also as the Mariners' or Drovers' Way. believed the route to have been used in the Bronze Age by drovers, traders and pilgrims en route from Ireland and Wales to mainland Europe. This route takes you over farmland with livestock in most of the fields. Our third photograph shows that we are being followed-are they U3A members? After a field with some lively bullocks we then headed downhill on a zig zag path through the woods and then on minor roads before we reached the railway crossing at St Blazey and could turn left just before beside the canal and railway line. With the traffic noise left behind we all had a peaceful stop and well earned lunch break. The now disused canal was replaced in 1874 by the Minerals Railway along side it that carried china clay until the 1990's; evidence of the rail tracks can still be seen on the path. After a further 15 minutes we were back in the car park and the end of our first new seasons walk. For the record our GPS analysis showed that we had covered 5.50 miles! We hope that you have had a good summer holiday and are ready for our new season of walks starting on Tuesday 9th September. Please let us know by Saturday 6th September if you are coming and able to offer transport. 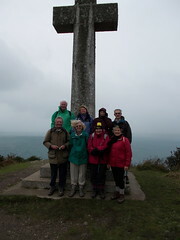 Twenty walkers joined us for this splendid walk to the Bodmin Beacon wonderfully lead and planned by Brian. 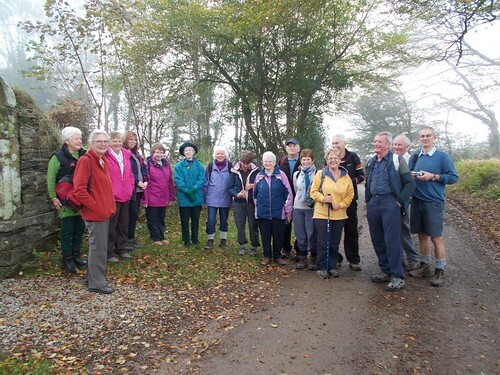 A group -designated A -set off from the Community Centre to meet up with Group B at Lanhydrock car park cafe for the first part of this 6.13 mile walk (we are grateful to Alan for this exact measurement;it beats the string and map used by other not so technical members). We crossed the wobbly bridge over the main road and walked along even terrain and then a gradual incline until we arrived at the Dragon Centre on the outskirts of Bodmin. Here we collected Group designated C and together walked through a housing estate with many twists and turns and eventually along side the railway line with wonderful views to our left across the unspoiled valley and then the climb up to Beacon itself. The views were magnificent with no sign of the town itself only the moors in the distance. After the usual picture with all groups A, B and C mixed together we had our picnics in the breeze and sunshine. The Beacon is sited on a Local Nature Reserve which uniquely combines rural charm and escapism with convenience and cultural history. The site is managed in partnership and covers 87 acres of traditionally managed farmland, public amenity space and community woodland. It is owned by Bodmin Town Council and Cornwall Council. The Beacon itself is a rounded hill lying in a prominent position adjacent to the town of Bodmin. At its highest point it reaches 162m with a distinctive landmark at its peak-the 44m(144feet) monument to Lt Gen Sir Walter Raleigh Gilbert built in 1856/7. The monument is a granite ashlar obelisk standing on a moulded pedestal base with inscriptions to each side. Steel reinforcing straps are attached at intervals up the shaft. We took a different route back down the hill crossing meadows before we returned to Beacon Road and the railway bridge just in time to be able to wave to the engine driver as he pulled out of the station and we could bring back all those memories with the smell of the steam. After a brief walk on the road we were again into the woods and back to Lanhydrock and back to Lostwithiel for 2.00pm. Many thanks to Brian again for a spendid walk. We will be starting our regular programme again in September with first walk on 9th September. More information to follow. 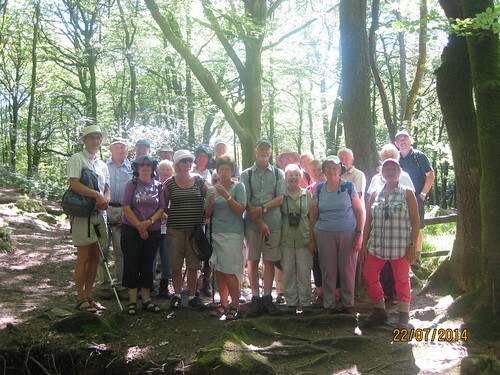 A record number of 23 walkers set off from Golitha Falls on a hot sunny day to walk the circular walk taking in three landmarks of this area. Golitha Falls is a series of small rapids where the River Fowey passes through a lush, wooded granite gorge, King Doniert's stones mark what is believed to be the burial site of a Cornish King who drowned in the River Fowey in the ninth century and Siblyback Lake one of the South West Water's main Cornish reservoirs and a popular watersports centre and recreation area. This is a circular route illustrated in the Classic Walks of Cornwall publication and shown to be 3.5 miles-to be discussed later.! and the impressive views towards the church and village of St Cleer. After a well earned rest to take on water we walked towards Siblyback on the road but turned left just passed South Trekeive Farm to take the footpath to the dam and the flat walk to the cafe and toilets at the lake and our lunch break. There's plenty more to do at this scenic lake, including miles of walks, a round lake cycle way (with bike hire), excellent bird watching, Siblyback Segway Experience, a track for water skiing, high ropes and archery, children's play areas and a cafe overlooking the water. However in view of our tight schedule we only had time to use the cafe, picnic tables and toilets and the water skiing and climbing would have to wait for another day. We then retraced our footsteps back to the dam to then take a different route back to the car park. Three of the walkers then examined their GPS devises to discover the real distance of the walk; despite the individual differences they all concluded that it was slightly more than the 3.5 miles quoted in the literature -maybe because the heat had caused the route to expand? as we assumed that the walk would take place at 16C. and not the 23C that registered on the car temperature gauge as we left; this had risen to 25C as we arrived in Lostwithiel. Park at Lanhydrock National Trust car park, toilets and cafe available on our return. Cross over the road and walk down the trail and through the wood before crossing over the A30 on the footbridge. Using quiet roads and over the railway bridge we proceed to the Dragon Centre. We then take the path behind the school leading to the Bodmin Beacon and returning via a different route back to the car park. Most of the walk is on good paths and minor roads with a couple of hills which are not steep. A distance of approx 5 miles. Anyone wanting a shorter walk can meet at Dragon Centre car park and walk to the Beacon and back. Meet at Community Centre at 10.15 am and bring packed lunch if required. As mentioned in our last e-mail we will be leading two official U3A walks during the holiday period one on 22nd July as detailed below and one on 12th August which will be led by Brian and is approx 5 miles and takes us to Bodmin Beacon-but more of that later. For the 22nd July walk we will be parking at Golitha Falls car park (free-although last time we were there the toilets had been closed) and walking on minor roads past King Doniert's Stones until we reach South Trekeive Farm and then on public footpaths to the dam at Siblyback Lake and then to the cafe and toilets, a packed lunch can be taken if preferred as there are ample picnic tables overlooking the lake. We will then retrace our steps back to the dam and then walk on footpaths and minor roads to the Falls. For those who wish we can then walk and view the falls before returning home. The total walk is 3.5 miles and relatively easy with only minor level changes HOWEVER for those who only want a short level walk there is the option of walking to Golitha Falls and on the surrounding woodland trails whilst waiting for the others to return. A very pleasant picnic can be had overlooking the river spotting the fish as they catch flies for their lunch OR drive to Siblyback and meet the rest for lunch-this car park is a Pay and Display. On a really hot day seven walkers set off from the Community Centre to drive to the car park at Trenarren, south of St Austell, before walking the 4 mile circular walk to Black Head and then back along the coast path. We started off along the minor road retracing our steps, with a view of St. Austell bay to the east, to Lobb's shop where we turn to head south to pick up the bridleway at Polglaze. With the recent lack of rain the way was dry and relatively easy walking as we proceeded easterly towards the picturesque Hallane Mill and a view of the sea again. The coast path has recently been repaired after the winter storms which meant that we could keep to the footpath and use the steps to rise above the mill and its secluded beach and head towards Black Head. After a packed lunch sat admiring the view and enjoying the sea breeze we visited the granite stone commemorating the life of Alfred Leslie Rowse (usually known as A L Rowse) who was born at Trenarren in 1903 and died in 1997. Walk on 25th June: To Black Head-a lovely spot! From small car park north of Trenarren we walk along minor roads before picking up the bridle path at Polglaze and then heading east to Hallane Mill-diversion in place here- and the coast path to have lunch on Black Head looking out to sea. We then retrace our steps and continue back onto coastal path travelling east to the car park. and then to revert back to normal programme in September. Any suggestions for these or future walks or for volunteer leaders of individual walks would be appreciated. Please let us know. Nine walkers left the Crown Inn, Lanlivery and walked along a very wet and muddy Saints Way to Helman Tor where we stopped to admire the all round view, trying to pick out known landmarks. From there we walked along the track towards Breny Farm following the path through Breny Common which also proved to be muddy in places. Reaching the road at Lowertown which we followed back up several hills to Lanlivery and the Crown Inn car park. As we had been given kind given permission to use the car park we thought it on proper to frequent the pub to show our appreciation. So a big thank’s to Betty Stogs for the refreshment and to Carol Williams for the excellent photograph. 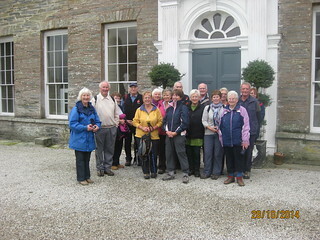 Fourteen keen walkers set off from Lostwithiel on a bright sunny morning to walk the 3.5 mile round trip to St Winnow. We used minor roads past Lanwithan and towards Polmena before heading along Newham Lane and the great views across the valley towards Cowbridge and the cemetery. At the imposing entrance to Newham Farm we headed downhill on the bumpy bridlepath towards the ford at the bottom. After a brief uphill section we turned right across the fields towards the river and the wooded section on its bank with the smell of wild garlic still strong in the air. Looking back you get a great view of the refurbished farm house and associated buildings. At the end of the wooded section we come out into the boat yard before visiting the beautiful church, the very interesting and free agricultural museum full of old tractors and farm machinery and the Food Hut where many decided to partake of hot drinks, home made pasties or pork rolls with apple sauce and much more-even ice cream for pudding for one person! Finally we made our move back up the road past the grand former vicarage before picking up the bridle path again at the top and retracing our steps back to Lostwithiel with the sun still beaming down on us- just as predicted. Tuesday 10th June Lanlivery to Helman Tor and Breney Common Nature Reserve. This is a circular walk of about 5 miles. The walk is on good paths and quiet roads with a couple of moderate hills - nothing too strenuous. We have permission to park in the Crown Pub car park at Lanlivery. Could you please let Brian know if you are coming, require a lift or if you will have a car available. This relatively easy 3.5 mile walk to St Winnow and back uses minor road, bridlepath and footpaths and takes in views of the countryside and Fowey esturary around Lostwithiel and St Winnow. No transport is required as we will be leaving the Community Centre on foot at 10.30am. Please meet at 10.15am as usual. If you could let us know by Sunday 25th if you are coming. No facilities are available on route. Due to unforeseen circumstances we had to pospone the walk on Tuesday 13th to Black Head but we will now be doing this delightful walk on Tuesday 24th June. All the information about this walk will be sent again to all members prior to the new date asking for numbers and transport. Information about the next walk on the 27th May will be sent to all members and posted shortly. Walk on 13th May: To Black Head-a lovely spot! Twenty walkers met at Bradoc Church at an ealier time than normal to be met by steaming hot teas and coffee made by Sue together with a choice of three types of biscuit- a real treat particularly for those who don't or shouldn't eat biscuits. Led by Robert we proceeded towards the Boconnoc Estate and with the kind permission of Mr and Mrs Fortescue were able to walk through the estate towards the obelisk. The group of cheery walkers can be seen in front of the 123 foot high monument build in 1771 by Thomas Pitt, 1st Lord Camelford, in memory of his wife's uncle and benefactor Sir Richard Lyttelton. After gathering in the stable yard and a comfort stop we were allowed to go into the church to view the unique votive panels and coat of arms of Charles 1st and listen to an amusing and enlightening talk by Mr Foot, a lay preacher who lives on the estate and has great knowledge of the history of both the church and the estate. We then took a different route back past some colourful azaleas and woodland to the church at Bradoc and more tea and coffee with our lunch. Great thanks to Sue and Rob for not only arranging the walk but providing a welcome drink at the start and finish of the walk. This 4 mile walk on gentle terrain has been organised and will be led by Rob and Sue Wheeler using some permissive paths over the Boconnoc Estate granted to us by kind permission of Mr and Mrs Fortescue. Our walk will start at Bradoc Church and we should arrive at 10.00am when tea, coffee and biscuits will be provided inside the church. Leaving at 10.30am past the gates of the Old Rectory and Coach House before passing the cemetery, where we may visit the graves of one or two people that might be familiar to us. We will then turn into the Boconnoc Estate along the long drive to the obelisk, downhill through Horsepool Cottage gate and toward Boconnoc House and Boconnoc Church. This will be open for us courtesy of the church warden Anthony Fortescue. Additionally Mrs Fortescue has kindly offered to greet us inside the church and tell us something of the history and to use this interval as our only comfort break on the walk. We will then return to the obelisk on a different and more uneven surface before retracing our steps back to Bradoc Church. On our return to the church we will find the kettle boiling and a hot drink provided with which to enjoy our packed lunch before departing home. On a bright breezy morning sixteen walkers, including some new faces, set off from West Looe to walk 4.5 miles of the coastal path to Polperro. Despite the previous days rain the path was surprisingly dry although the storms of February have caused landslides causing one major diversion out of Talland Bay. Setting off from Hannafore the path passes St. George's or Looe Island as we proceed steadily to our lunch stop and public toilets at Talland Bay. Fully fed and watered we all proceeded at various speeds up the steep and long incline, taking in the diversion which made the climb even longer, before we rejoin the coast path and walk down into the busy town and towards Crumplehorn and with our bus passes in hand our bus back to Looe. On a day predicted to be dry and sunny twelve group members set off from Scarlett's Well Car Park in Bodmin to start our Treasure Trail; to exercise both mind and body and learn more of the town on our doorsteps. I know that everyone, even those who have lived in the area for a long time, learnt something of the buildings and characters that make up Bodmin's history and despite a few wrong turns and missed clues all had an enjoyable morning. We visited the enchanting ruined chapel at the rear of church of St Petroc with its hanging aubrietia from every wall, the haven which is Priory Park and the Bodmin Town Football Ground and saw the drinking trough erected by Prince Chula of Siam before returning via the granite cross at the top of Lower Bore Street and back to the car park. Thanks to Brenda for proposing the walk and the organisation. It is well worth a go, and recommended for any visitor to the area, as well as those new to the area and those who may just drive to the supermarket or drive through the town. Perfect timing for today's walk at Minions - Spring arrived! We had a wonderful turnout of 19 people for today's walk arranged by Alan. We all enjoyed walking with the sun shining down on us and the birds singing happily. We walked from the Heritage Centre car park at Minions up to the Cheesering and then strolled across the moor to the Hurlers. Much chit chat along the way as we marvelled at the beautiful views and clear air. A few recent dry days meant that our footing was quite dry, just as well as we sat on the ground at the Hurlers for our picnic lunch! As we drove away we all felt buoyed by the start of Spring and the prospect of more walks to come! A quick change of plan meant that we headed for the seaside rather the trail around Bodmin-that walk is still to come- and did the short level walk from London Apprentice to Pentewan. Eight walkers took part including two new members ably led by Reuben and the weather looked good as we set off although rain was forecast at 1.40pm. We passed a few dog walkers and runners but otherwise the sounds were of the river and the group members discussing all topics of interest. Once at Pentewan some used the cafe to take on refreshments and others sat outside on the benches and consumed their picnics. After a suitable rest we took to the sands ,watched some hardy soles in the surf, almost got our feet wet and dreamt of those sunny days to come. We returned by the same route, although some took an "alternative route" until our leader who was then at the rear put us on the correct course and we arrived back at about 1.30pm. True to the leaders prediction-why do we doubt him-it started to rain just on the outskirts of St Austell at 1.40pm. A good morning was had by all, exercise,sunshine. sea breezes and good company. 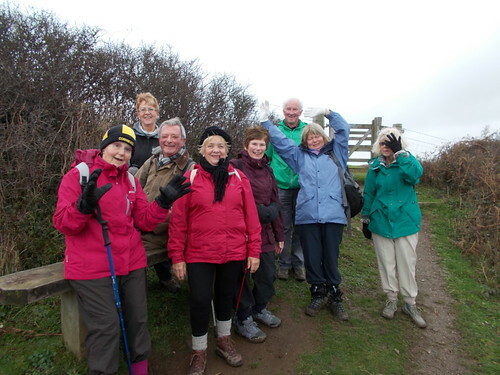 On Tuesday 14th January, 11 walkers from the Group met in the town car park and proceeded to walk out of the town along Liddicoat Road to Cott Road where 2 more walkers joined us. The walk continued to Downend turning right and right again into Two Trees Road walking to the junction with the Lerryn Road. A left turn took us past Tredithick Farm Cottages after which we once again turned left and on to St Nectan’s Chapel where we stopped for refreshment. The walk then took us through the graveyard, over a stile and through a field to a new gate which had only just been fitted. The workmen said that “we were the first walkers to use it”. Across the road and back to Downend then turning past the school and the entrance to Peregrine Hall and on to Polscoe. A path on the left took us back to Cott Road and the Car Park. The walk was around 5 miles and enjoyed by all. Thank you to Brian for leading the walk and writing the report. 10 members of the walking group assembled for the local walk, we welcomed 2 new people to the group.The walk was organised by Janet and Chris Dimond and started from the Community Centre. We walked up Tanhouse Lane to the new gravel path on the left -hand side. The gravel path is very steep and several of us approached it with trepidation, however we all managed to get to the top, commented how it seemed less steep than our memories recalled. At the top we turned right, walked to the end of the lane, then across fields, to be greeted with a splendid view of Restormal Castle. We then walk down the hill towards the Castle, then down the lane towards Duchy cottages, at this point some members of the group returned to Lostwithiel, and others walked across the river bridge to Duchy Garden centre for refreshments. This walk will be remembereed for the glorious autumn colours and the views across Lostwithiel. Again several members of the group had not done this walk before and others were able to point out landmarks and tell us some of the local history.